New Timber Sleepers and Reclaimed Railway Sleepers are used for many exterior applications. You will find many used around Golf Courses, Open Spaces, Nature Trails, Footbridges and in Gardens. One of the main problems with these, however, is the potential to slip when wet. Our GRP Anti-Slip Flat Plate Treads are the perfect answer to slip prevention in the long term. We supply to hundreds of Golf clubs in the UK and Europe. Course Manager began to become aware of members slipping on the sleepers at the course. 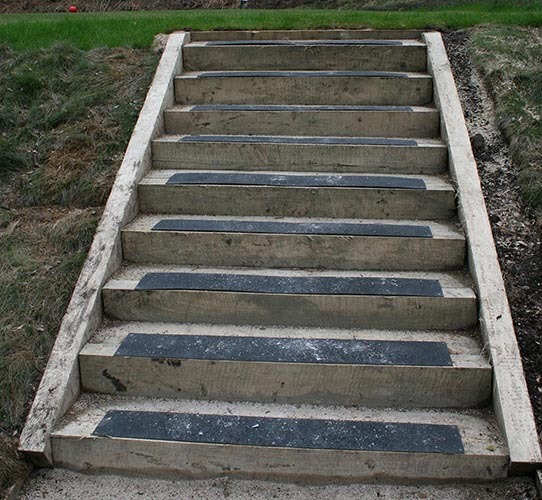 The sleepers, designed to allow the club's members to traverse the magnificent grounds, became unsafe when wet. They chose wooden sleepers for their natural appearance, but the number of accidents called for a response. After unsuccessful attempts at using chicken wire to cover the sleepers, they decided upon our neat and tidy and most practical product. Our anti-slip tread plates will outlast any other method. Manufactured from corrosion resistant GRP substrates and polyester resins incorporating refined high-grade aluminium oxide aggregate granules for an extremely durable and slip resistant finish. This product can be pre-cut to your required measurements and very easy to install with screws and adhesive provided. "Since installing GripClad Anti-Slip Flat Plate Treads I have been thoroughly impressed to find that the grip performed just as well in the rain and hard frost."